In true Land Cruiser tradition, this build was made to go where few vehicles can. 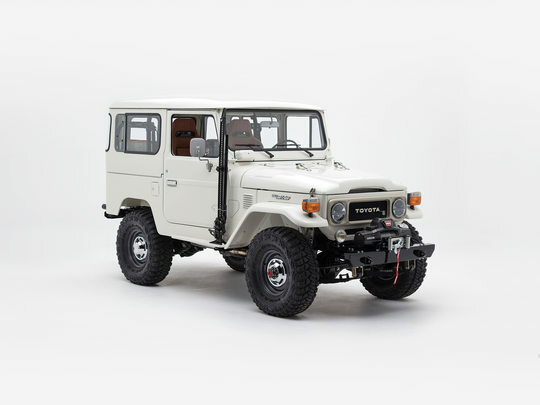 Custom-built for our client in Denver for his off-road adventures in Arizona, we’ve equipped this FJ40 to handle high-altitudes and extreme conditions. Fun and fury, grit and grime, this Land Cruiser has the beastly ambition to thrive in its natural habitat once again. The FJ40 draws you in with its classic shape and iconic grille — a look that’s been carefully infused with a modern edge. Its super-tough Goodyear MT/R® tires feature DuPont™ Kevlar® fiber and a wrap-around tread, perfect for a little mud-sloshing, rock-crawling, water-forging fun. The expedition bumper with Warn ZEON 8 winch and a side-mounted Hi-Lift Jack give this classic ride a custom off-road look, not to mention a heavy dose of added utility. This FJ40 backs up its tough looks with serious grit. The engine was upgraded to a fuel-injected Toyota 1FZ with 210 hp, and a 5-speed transmission - a modern powertrain with the muscle and determination to conquer all terrains. This bump in power is backed by some serious capability features, including an Old Man Emu suspension with high-performance Fox Shox and ARB air lockers. This Land Cruiser is now equipped to take on the rocky red clay roads of the Arizona backcountry with confidence. The interior cabin of this FJ40 is rugged and sporty. Trimmed in weather-resistant Saddle vinyl, Recaro Speed seats hold the driver comfortably in place in extreme conditions, and are easy to clean and maintain. This vinyl material lines the jump seats in the back and the interior door panels. Creature comforts like a modern climate control system and premium sound system, complement the iconic dash with its retro pull-knobs and the upgraded digital cluster. With a 1GR-FE engine and other modern upgrades, the G40 Expedition by The FJ Company takes the classic adventure-mobile into uncharted territory. Customize yours!